The Historic Monuments Zone of Tlacotalpan represents the townscape of a Spanish colonial river port. 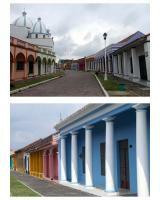 The buildings are mostly single-storey and in Caribbean style, with exuberant use of colour. 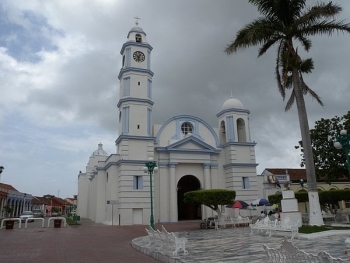 The town of Tlacotalpan was founded on the banks of the Papaloapan in the mid-16th century. It was laid out in the checkerboard style. It contained separate quarters for Spanish and natives. This to me was the least interesting colonial town (WHS or not) I got to see while travelling Mexico. There is very little to see and do; I think you could finish your visit within the hour without rushing things too much. Unfortunately, I had already booked a hotel room and had to stay for the night. In fairness, what makes this side a bit different from other colonial towns, is it's orientation to the river. It's built towards the river and kept somewhat a feel of a port city, even though there isn't much left of the port. If this makes it a worthwhile WHS candidate, though, I doubt it. You can go to Oaxaca via Tuxtepec. There are busses running from Tlacotalpan to Tuxtepec. From Tuxtepec to Oaxaca you can either take another bus or search for a colectivo. The colectivo stand is literally around the block from the bus station (think the street was Melchor Ocampo, but better ask). The trip is long, but so is any trip from Chiapas to Oaxaca. You can go by bus from Villahermosa via Cosamaloapan. From there you can take a regular third class bus to Tlacotalpan. Tlacotalpan is the “odd man out” among Mexico’s plethora of UNESCO-inscribed old “colonial” towns. Whilst others have expanded way beyond their original size, this sleepy backwater has regressed from the importance it once had. The result is a very pleasant lethargic mood. 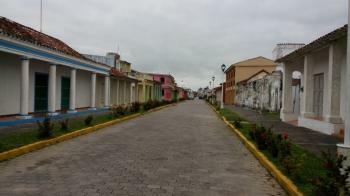 Now largely devoid of boats, the river, the original reason for Tlacotalpan’s founding, slips sluggishly by, remarkably few cars disturb the quiet streets, and the rows of mainly well restored brightly painted and “classically” arcaded houses (photos) provide a civilised, refined ambiance (the town appears to have had a considerable “brushing up” in advance of its inscription). There are no “great” buildings or sights but even a few hours (we spent an overnight and morning) here will relax and recharge the spirit. The town’s peak was reached around 1880-1910 and, following many fires, few buildings are any earlier. We were there in March, a relatively cool time, but there was still a sultry, soporific, humid atmosphere – rainy season might not be so pleasant! I understand that the town gets very busy at the Festival of Candelaria (when there is “Bull running” and a river boat procession of the Virgin) but at other times it remains its sleepy self. There are a few hotels and also a number of guest houses, a couple of restaurants on the very pleasant Zocalo and on the waterfront – fish/sea food is a speciality here. Everywhere is easily walkable. Getting there is relatively slow from/to Vera Cruz along a road with a fair number of the infamous “topes” or road humps – also a couple of toll bridges. From/to Tuxtepec you are in sugar cane country and the road is full of long tractor-driven “cane trains” to exacerbate the frequent “topes”. So I can understand why a previous reviewer didn’t find the journey particularly pleasant but we thought it well worth the hassle. Don’t come for museums or major sights but rather to get an impression of a by-gone time in “Old Mexico”! Tlacotalpan is a town that time has passed by. That's a good thing. The town is the most colorful town I've ever seen. It also has the most power lines. The colonial style town is significant simply because it has been forgotten - mostly since it's no longer a port city due to sedimentation. The entire town shuts down for several hours for a siesta in the heat of the afternoon. This makes a perfect time to wander around and take fantastic photographs. The museum is very primitive but the photography in the museum is fascinating. This is a town that you cannot get a feel for by just taking a quick bus tour through. You need to walk, and talk to the locals and just watch the dust settle. Tlacotalpan is about 1.5 very bumpy hrs. south of Veracruz. I'm mexican, i'm from this place, and it's an honor to belong to one of the most colonial places that are left in the world. It's culture, it's charisma, they are alwayas in plan of party, they dance a lot. You gotta visit, it's extremely wonderful. This was an excursion tour from our Holland America ship from Veracruz. The bus ride was very long and the stay in the town only about one hour. Except for our tour group the place was mostly deserted. The one hotel refused any of us to use the bathroom. The streets were interesting and the empty buildings colorful, but overall the town seemed run down. Visiting the museum we found dark halls with ceiling lights that we were told didn't work. The guide continued her speech but very little could be seen. The apothocary may have had some interesting shelved antiques, but the display of Barbie dolls, hair creams and misc stuff spoke for itself. This place must have seen better days, but why waste the over two hour of bus time. Why would a museum have inoperative lights installed? Maybe when UNESCO visited it was great but not now. Its an amazing hidden treasure. Its tranquility gives peace and its colours happiness. Frozen on time this colonial town has a reason to be recognized as world heritage site.